A young couple poses for their portrait at the studio of photographer, H. Larson, in Minneapolis, Minnesota. The gentleman has long hair and glasses. He has a scholarly appearance. The woman’s figure is improved by a corset. She appears uncomfortable, illustrated behaviorally by the position of her arms and hands on her abdomen. This couple appears emotionally separated from each other. There is no intimacy captured in this photograph. 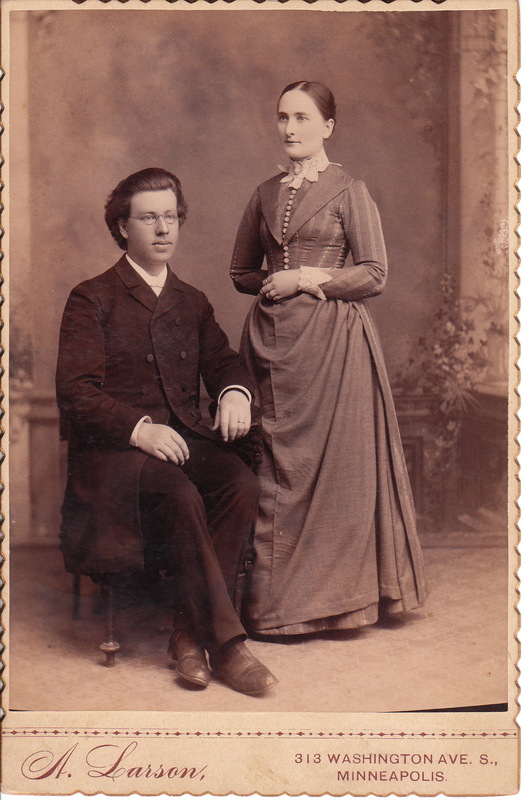 Although the couple is posed together, they do not seem to be together. Perhaps the couple is really not physically together in the studio and this image was doctored by the photographer, who added the gentleman to an existing photograph of the woman. Herman Larson was a Swedish immigrant who came to America through Sweden in the early 1900’s. In Sweden, he held a degree of Master Photographer and was knighted by the King of Sweden for his excellent work there in the late 1800’s. In 1904 he established his photography studio in downtown Minneapolis. Much of Larson’s work came from the theological, church and public schools in the area. The studio remains in business today and its web site discloses that it still possesses Larson’s panoramic circuit camera. The site also reports that Larson semi retired in the early 1950’s.To view other photographs by Larson, click on the category “Photographer: Larson”. A woman poses for her cabinet card portrait at the studio of Larson, in Minneapolis, Minnesota. 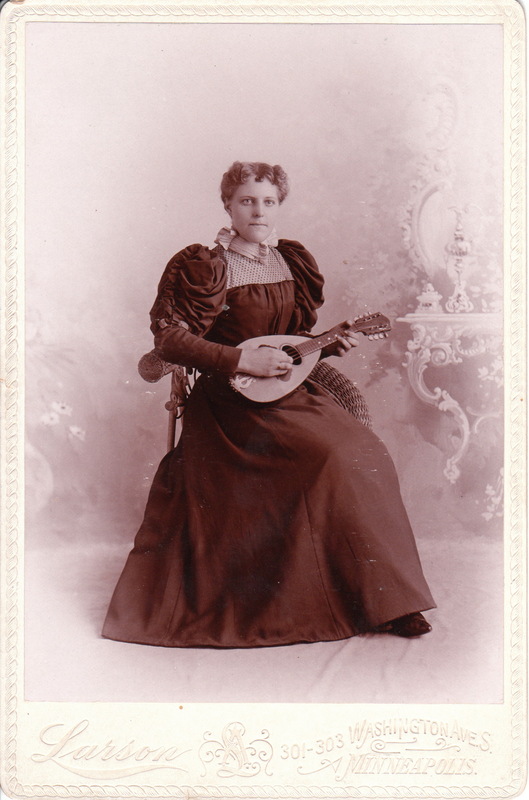 She is holding a musical instrument that appears to be a mandolin. Perhaps a visitor to this site can more confidently identify her instrument. Click on the category “Photographer: Larson” to view other photographs by this photographer.